So the first thing I will say is, this post is all about having fun. This isn’t about making traditional world class Sushi Nigiri as I am not a sushi expert. In fact, I am actually quite an amateur, however, if you have ever wondered how to make any kind of sushi, I believe this is a great place to start. I absolutely love sushi, in fact, I would probably list it as one of my top 5 favorite foods. I always grew up eating the $3 – $5 sushi, which don’t get me wrong, I still love it and I buy it for lunch all the time. However I eventually started asking myself, what distinguishes this cheap sushi from “proper” sushi? Well, this question eventually led me to an amazing sushi restaurant bar one day called ‘Aisuru Sushi’, and it is still to this day the best sushi I ever had by a mile. 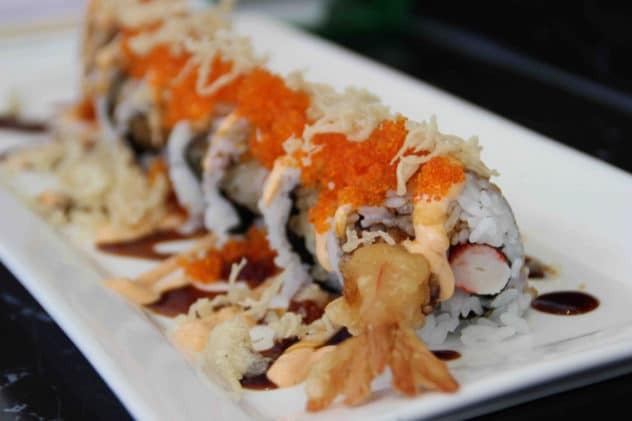 This is what I ordered at the restaurant, it was sushi with deep fried prawns, caviar, spicy mayo and bits of fried tempura on top. 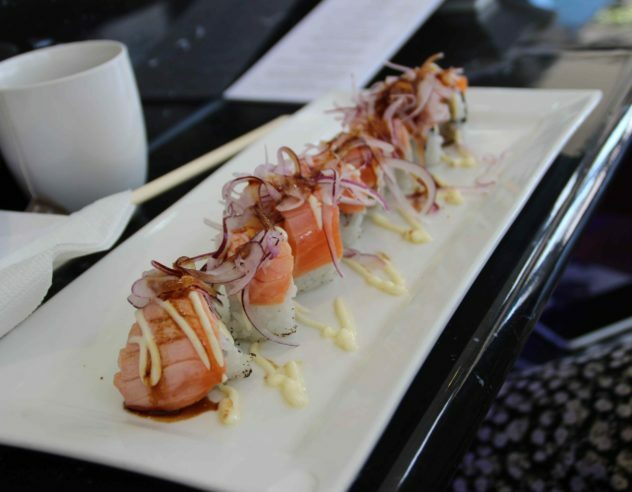 And this is what my girlfriend at the time ordered, sushi with seared salmon then topped with Japanese mayo, red onion and soy sauce. And what I noticed about her’s, was that it seemed simple enough to try and replicate. Obviously, there is no way I can make sushi that well, but ever since then I wanted to try it myself and see if I can make a recipe out of it. And here we are! What the chef did at the sushi bar, was use a blow torch to sear the top of the salmon right in front of us just before serving. Which I got so excited about, and that is the inspiration behind this recipe. 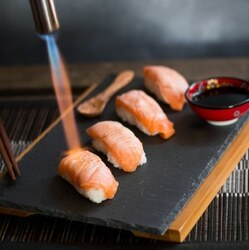 However, I am sure there are many people who would prefer there salmon fresh rather than seared. So I made that step optional in the recipe. If you decide to try this recipe, I hope you have as much fun making it as I did. And remember, this recipe is about having fun, not about being a sushi expert. Thank you for the time you spent on this post, stay tuned because soon I will upload a post featuring a Madeleine recipe for valentines day revealing my feminine side. 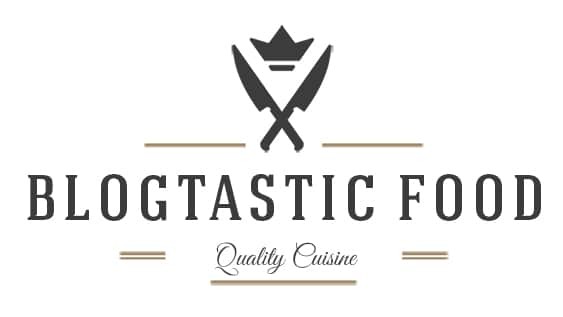 Feel free to subscribe to my blog (you’ll get a free recipe ebook if you do 😉 ), and have a super awesome day. A fresh and simple sushi nigiri that a complete sushi amateur like myself can do. Put your rice in a sieve or colander, then rinse the rice under cold running water for about half a minute just to get rid of some of the starch, then add to a pot. Next add 1 and a half cups of water to the pot, bring to the boil, once it's boiling turn the heat down, cover with a lid and gently simmer for 20 minutes. 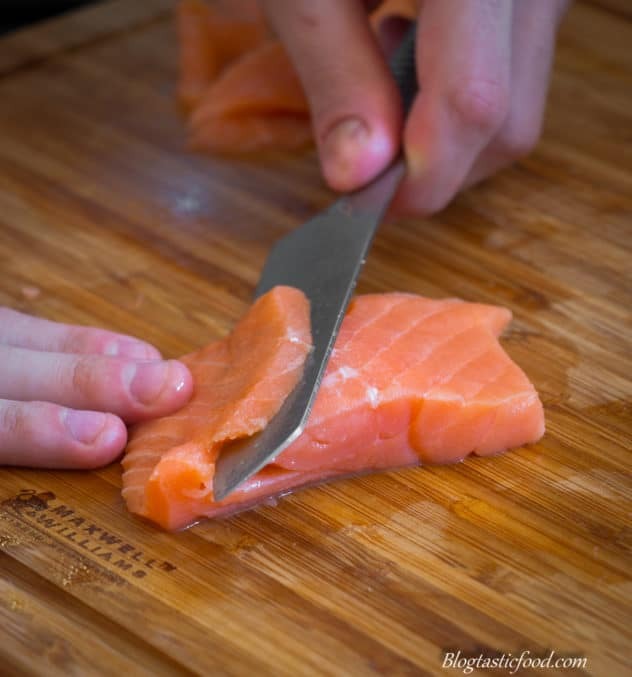 Meanwhile, get your salmon on a chopping board, then use your knife to carefully slice your salmon fillets on and angle. Slice the salmon about the thickness of a thick coin (look at the first picture on the post if your confused). Boil some water in your kettle, then put your sliced red onions into a bowl. Pour and cover the red onion with the boiling water and leave for about 10 minutes. Drain the onions and then leave to dry on kitchen paper. Once all of your salmon is sliced and your rice has cooled down, get a bowl of cool water and just slightly wet your hands so that the rice won't stick too much. Get some of the rice in the palm of your hand and firmly shape the rice into a small rectangular log. Then, carefully drape a slice of your salmon over the top. The more you practice this the better you get. 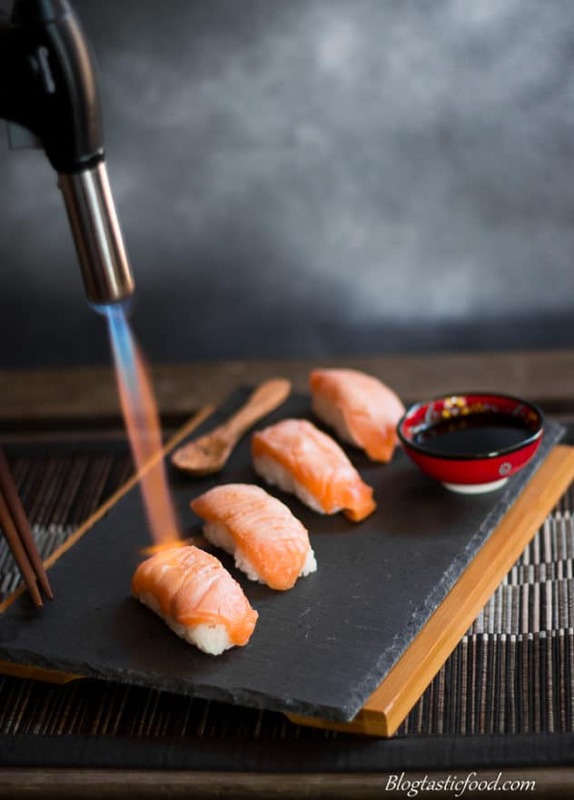 (This step is optional) Once you have shaped all of your sushi nigiri, you can then sear the top of the salmon with a blow torch. You want to sear it just enough so that the top of the salmon develops a nice light color. 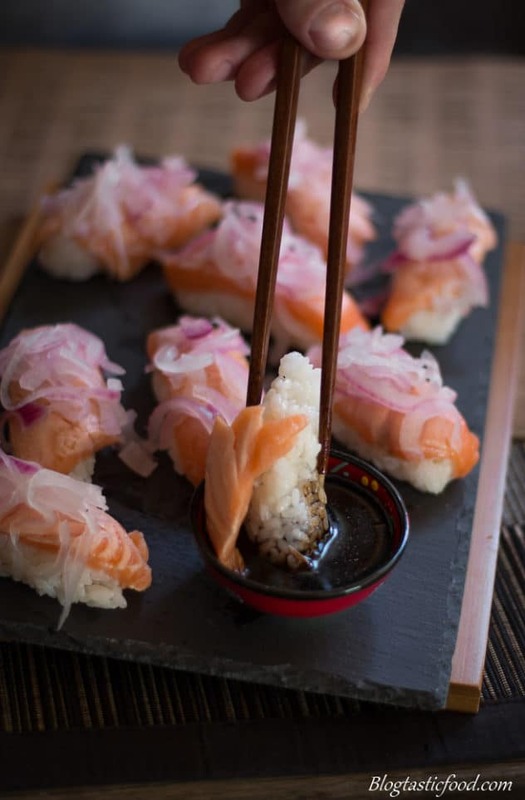 Finally, garnish the top of your sushi nigiri with the red onion and serve. 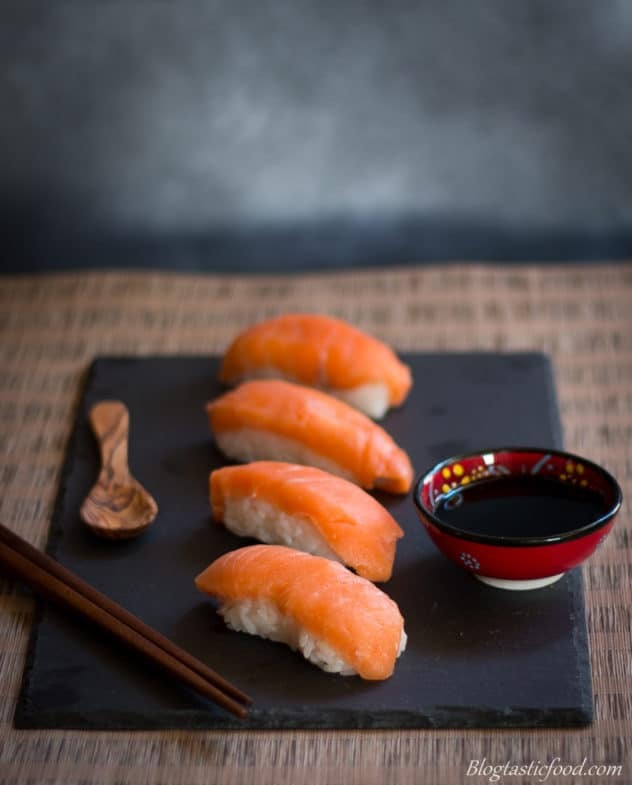 If you cant get hold of sushi seasoning, then you can put 2 tablespoons of rice vinegar in a bowl, along with a good generous pinch of salt and sugar. Then stir together until the salt and sugar have dissolved and then add that to your rice once cooked. Thank you Aboleyn (: The searing seems intimidating at first but it is actually quite fun once you start doing it. You could even just use one of those small torches people use for lighting bbqs and stuff. Thanks for your comment. I love sushi and the fact that you wrote this is about having fun.